So, after 20 years, how well have the consensus scientists done in forecasting the climate? It could be said the results are patchy. The cooler part of the IPCC forecast was on target until the last couple of years and still has a chance of being correct. What the IPCC called the “Best” estimate was close to reality until about 10 years ago, with recent observations representing a major excursion from the model. The warmest forecast, the one used by the extreme extremists, has been and remains totally out of touch. The highest temperature predictions were quite loony. Those forecasters knew little about the climate. Clive Best includes an interesting comparison between the surface-based and satellite datasets, which show good correlation and have similar trends — which gives one confidence in the accuracy of the “new-fangled” satellite microwave thingummies. 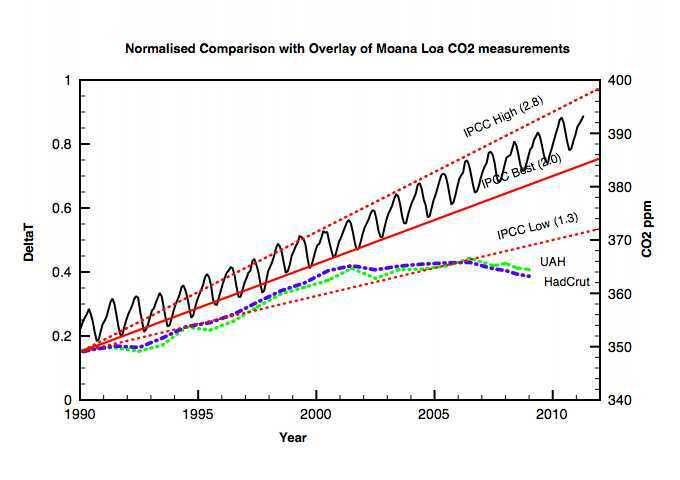 He includes a graph of the atmospheric CO2 levels, showing a very steady, unchanging increase. I notice they are little perturbed by either the temperature fluctuations or our industrial output. Now, all you who’ve predicted doom for the world for 20 years and more, when will you set up a fund, including your own personal houses as collateral, to provide for compensation to be awarded to those innocent, trusting souls who have, in great faith in your wisdom and knowledge, taken expensive yet unnecessary action against the looming climate perils? It’s all very well to make wild and alarming predictions, to stand for a while in the limelight, to have your every word repeated around the globe and acknowledged by the highest in the land. But, when the results are plain for all to see, when everyone knows you have utterly failed, do you have the strength of your own convictions? Do you stand by the damage you’ve done with them? Will you, like honest men, make things right and repair what you yourself have broken? Or will you take refuge in the weasel words you always used, your empty claims you never made predictions, only offered scenarios? Will you slink away, whining you’ve done nothing wrong? Will you deny all the misery you’ve caused, all the children’s nightmares you’ve brought among us? And with all of that, deny your own humanity? CO2 levels in the atmosphere have continued to rise over the last 10 years … but temperatures have not risen since 2000. This implies that CO2 is not the main driver of global temperatures on these time periods and that other natural mechanisms are at least as important. No evidence of any positive temperature feedback with increasing CO2 levels is found. I’ll suggest to the MfE CC that they publish this comparison plot on their website to fulfill the need for such in the GAT category. I don’t see how any of the accusations made have any impact on the actual science. UEA may not have been as open as they could have been, however given the nature of the FOI requests I’m not surprised. To me it looks like a well conceived trap that the scientists fell for hook line and sinker. However the science remains unchallenged. Nick, the ‘science’ very much remains challenged. UEA’s refusal to release their data in support of their published surface temperature findings is unscientific. Their gamesmanship evidenced in the Climategate emails reveals that they knew their ‘science’ would be found wanting if a successful challenge was made, hence their blocking FOI requests and pressuring journal editors to not publish any challenging papers. This fortress mentality is alive and well today. It is still very difficult to get papers published which, despite good science, go against the orthodoxy. Why is it that if the science is so robust, questions are forbidden, source data remains mysteriously lost or unavailable, and dissenting views are quashed? The following is the reproduction of the email exchanges involved in the contribution of our paper (Lindzen and Choi, “On the observational determination of climate sensitivity and its implications”) to the Proceedings of the National Academy of Sciences. Nick, I’d suggest you read “The Hockey Stick Illusion” by Andrew Montford. This deals with the central issues around the UEA affair. I would agree that it does not challenge the AGW thesis as such. Most of the book was written before the emails were released, and shows some very dubious professional practices. There were other issues that arose in Climategate, notably the UHI issues, but the multi-proxy issues were key. Having looked at this stuff for a couple of years or so, I find it hard to say objectively the “there is nothing wrong with the science”. Nick, the science is being challenged but the challengers access to station data has been blocked by UEA. Professor Jonathan Jones of Oxford University (like me, an alumnus of Corpus Christi, Oxford), is a Bishop Hill and CA reader and was one of several CA readers who requested the CRUTEM version sent to Georgia Tech earlier that year. Personally i think any dodgy data is 20th century but there doesn’t seem to be the same situation this century. To create a fictitious warming trend in GAT this century requires the despicable adjustment that Dr James Hansen indulges in with GISSTemp. I.e if any spurious warming has been introduced, it was done last century but that cannot effect this century’s trend (no warming). “… CRUTEM was an almost microscopically small issue in the Climategate emails – Climategate was about the Hockey Stick and its handling by IPCC, not CRUTEM. CRUTEM was mentioned in only 25 emails and, even then, often passim,” explained McIntyre last year. “My long-standing position on CRUTEM was that CRU’s obstruction of data requests was most likely due to its desire to conceal that it did so little work on quality control; that the CRU result could be derived so trivially that, in effect, CRU no longer served any useful function in this field. What??!!! You mean [gasp] it’s NOT worse than we thought?? Great stuff RC – thanks. Increase in particulate emissions from Asia over the last decade have masked the effects of the CO2. I would be interested to hear your thoughts on the paper and how this affects your position on AGW. Would (further and more comprehensive) evidence of an effect like this be sufficient for you to change your views on how strongly CO2 affects the climate without actually witnessing additional warming? The Kaufmann paper has been discussed fairly rigorously, and is less than convincing. Basically, they have noted the lack of warming and tried to come up with a human cause for it. For some reason these people simply cannot bring themselves to admit that natural variation completely swamps any tiny human-induced signal that may or may not exist. Judith curry has an informed posting on the subject, and I tend to agree with her. The paper doesn’t actually measure increased aerosols, it simply infers them from consumption figures. Judith actually goes in search of evidence that aerosols have increased, and finds little to back up their claims. Note that their aerosol forcing (purple line – Fig 1) increases from around the year 2000, yet the peer-reviewed literature (Remer et al.) shows that at least until 2006 there has been no detectable increase in aerosols. The reality (I believe) is that the blue (net anthropogenic radiative forcing) line (Kaufmann Fig 1 – see also Hansen ) is too high (due to an incorrect climate sensitivity), and this necessarily results in the purple line having to compensate for the lack of observed warming. Good work, Bob. My question is: what’s happened to the aerosols in warmer times, or do they appear only during cooling? I believe most large cities around the world monitor their aerosol and pollen counts; do they observe a reduction during warming? I don’t think they do. The aerosols make an appearance only during cooling, as if by magic, but it’s out of convenience and not a result of observation. The aerosols in this case refer to the increased atmospheric sulfate concentration from coal emissions. These are, as you say, fairly well monitored, and show no significant increase since 2000. Also, if we believe the ‘missing heat’ argument, increased aerosols should have no major effect, as there is already so much ‘warming in the pipeline’ stored in the oceans (somewhere) that even if we were to cease all emissions, the temperature would still go up for a thousand years (a la Tim Flannery). Cheers for the links Bob, I always appreciate getting both sides of the argument. The Remer paper only starts in 2000-2002 and finishes in 2006 so it can hardly be considered a comprehensive rebuttal and as far as I can see does not deal with long term trends at all. That said the Kaufmann paper is very new so it will be a while before supporting or disproving papers are published. Thought you might be interested in an explanation for lack of warming given our previous discussions however. I’m a bit confused about the natural variability that you are talking about. You seem to use it as a catch all for any observed warming or cooling trend without any effort to quantify or measure it. I feel like you are invoking an “invisible agent” which explains everything, I sure this is not your intention so could you clarify exactly what you mean by natural variability? The claim that the solution to AGW is to burn more coal is odd given the vastly different atmospheric lifetimes of CO2 and sulfates. It is hard to believe Dr Curry or yourself would genuinely suggest this in good faith. Nick, personally I find this idea that aerosols have magically cancelled out the warming effects of CO2 a little implausible, given that they have little evidence to support the aerosol concentrations that they are suggesting. Also, how is this aerosol effect suddenly global? Would we not expect to see regional variations in this cooling effect? In terms of the suggestion that burning coal is a “solution” to AGW, I would suggest that this comment is largely rhetorical, as I don”t think either Judith Curry or Bob think the idea is plausible in the first place. However, given that there are some fairly crazy geo-engineering proposals knocking around, from giant mirrors in space, to cloud seeding with gigantic ships (Bill Gates) then putting more aerosols into the atmosphere should be considered a potential solution, given that the scientists are claiming that it solves the “problem” in this paper in the first place. Natural climate variability on decade-to-century time scales is best defined in terms of the bio-chemical-physical system that must be studied, the principal components of that system, the mechanisms active within each component, and the interactions between components. The main components of the earth system are the atmosphere, oceans, land surface, snow and ice at the surface of both oceans and land, and biota near the interfaces of atmosphere, ocean, and land. The natural mechanisms include radiative transfer, the planetary-scale circulation of the atmosphere and oceans, photochemical processes, and biogeochemical cycles of trace-gases and nutrients. The major interactions between the components of the climate system so defined are given by the exchanges of energy, momentum, water, and trace constituents, which take a large number of specific forms. For instance, ice-albedo feedback affects radiative transfer in the atmosphere and the heat exchange between it and the underlying high-latitude surfaces, and evaporation-wind stress affects the feedback between the tropical atmosphere and oceans. Establishing a baseline of natural climate variability over decade-to-century time scales requires a perspective that can be obtained only from a better knowledge of past variability, particularly that which precedes the pre-industrial era. Information revealing these past climate conditions is contained in historical records and “proxy” indicators. The historical records of climate (other than systematic weather observations, which began in the late 1800s), while invaluable because of their scope and often uniquely relevant perspective, are usually limited to the last several hundred years (see Chapter 2). The proxy indicators represent any piece of evidence that can be used to infer climate. Typically, proxy evidence includes the characteristics and constituent compositions of annual layers in polar ice caps, trees, and corals; material stored in ocean and lake sediments (including biological, chemical, and mineral constituents); records of lake levels; and certain historical documents. Such proxy indicators can provide a wealth of information on past atmospheric compositions, tropospheric aerosol loads, volcanic eruptions, air and sea temperatures, precipitation and drought patterns, ocean chemistry and productivity, sea-level changes, former ice-sheet extent and thickness, and variations in solar activity—among other things. These records are particularly appropriate for detecting three manifestations of climate variability: Periodic or near-periodic variations (the latter are those that become evident only after examination of considerable data through which a clear statistical signal stubbornly emerges); Large and pronounced climate signals, such as severe and sustained droughts, drastically altered precipitation patterns, anomalously warm or cold periods, or floods; and Gradual trends, infrequent shifts, or other characteristics of natural variability that are difficult to recognize without the benefit of a long, continuous (or near-continuous) record. Because the bulk of these proxy indicators are recorded naturally, their time span is potentially unlimited; their resolution and accuracy are limited only by the fidelity of the recorder itself. These “natural archives” are simply there for the taking—awaiting discovery, recovery, means of extraction, and interpretation. Consequently, proxy indicators represent a potential treasure trove of unique past climate information. Then inquisitive people (astrophysicists mainly) go in search of correlations that may provide clues as to the drivers of natural variations – and find them. The Remer paper is simply showing that during this decade there has been no increase in aerosols. The Kaufmann paper relies upon an increase in aerosols this decade. Dr Curry references other papers as well, for longer term trends, which all show a decrease in aerosols since the 1970s. The ‘burn more coal’ comment was definitely tongue-in-cheek, yes. But the underlying point is that if burning coal produces CO2, and at the same time it produces enough aerosols to exactly balance out the warming effect of that CO2, why are we panicking about global warming? Regarding natural variability, see Richard C’s answer above. Only when scientists have proven that the climate system is responding outside of the known history of natural variability, can we look at doing something about it. To date this has not been done – all the current change rates are well below historical levels, and when we start to look at geological histories, we realise just how stable we are at the moment. Another, more subtle point about natural variation should be made here too: scientists in general are quick to point out areas of uncertainty and lack of knowledge. Among the IPCC-related scientists, however, there is an appalling degree of arrogance. They claim repeatedly that they fully understand our climate, to the degree that they can isolate one variable (CO2) and ‘prove’ that the only way they can get their models to balance is if they include the influence of CO2. The truth is that we don’t understand our climate to this level at all. We simply don’t know what caused most of the variations in our climate history. This is true of even very recent history (MWP and LIA). So for anyone to claim that we can model the ‘normal state’ of our climate is somewhat audacious. We’re beginning to see the early signs of panic among the climate modellers. The Kaufmann paper is an example. In essence it admits to a lack of warming, and tries to explain it away by resorting to an undemonstrated change in aerosols. The Trenberth and Fusallo paper was similar, its approach however was to claim that aerosols weren’t blocking incoming solar radiation, instead the oceans were simply absorbing it in places we can’t find it. All of these papers, however, have finally come round to admitting that they don’t, in essence, know what’s going on. A bit more humility from these ‘scientists’ earlier on would have saved us all a lot of bother. Good summary, Bob. It’s a simple enough message, reinforced by Judith Curry’s discussion on consensus, but one with the power to derail the IPCC’s mission. We need enough people to understand the simple point that their revered climate scientists have used unsatisfactory practices to reach agreement and to strongly promote an insecure conclusion. Regrettably there are many faithful climate scientists who will be tarred with a dark brush, but that cannot be helped and must be done. A lot of “bother” indeed! True enough Richard. However, I think some of the honest scientists will come out of the whole affair with their reputations intact, if not enhanced, when the history of this sordid period gets written eventually. People like Chris de Freitas, the late Augie Auer, and Willem de Lange will stand out in the New Zealand context as battlers on the side of truth, standing against the political tide. We’ve seen the level of muck some people will wallow in to try to silence them (Chris Barton of the NZ Herald comes to mind here) but in the long term they’ll be vindicated. Across the ditch we have Bob Carter of course, Ian Plimer and Cliff Ollier among others. At the top the honest brokers will always stand out: Richard Lindzen, John Christy and Roy Spencer have taken the brunt of the assault, ably assisted by Steve McIntyre. So for every Wall of Shame there is a Hall of Fame.